An explosive action tale of betrayal and revenge, The Losers centers around an elite Special Forces unit sent to the Bolivian jungle on a search-and-destroy mission. But the team – Clay, Jensen, Roque, Pooch and Cougar – soon find that they have become the target of a deadly double cross instigated by a powerful enemy known only as Max. Making good use of the fact they’re now presumed dead, the group goes deep undercover in a dangerous plot to clear their names and even the score with Max. $9.406 million on 2936 screens. Where would movies be without ragtag bands of scrappy outcasts? Oh, I guess cinema would do fine anyway, but rough-hewn underdogs remain a big screen staple, one that gets another examination in 2010’s The Losers. Adapted from a comic book series that ran from 2003-2006, Losers introduces us to an elite US Special Forces group. This collection includes communications/tech expert Jensen (Chris Evans), sniper Cougar (Óscar Jaenada), transportation and heavy weapons guy Pooch (Columbus Short), and demolition/tactical leader Roque (Idris Elba). They work under the command of Colonel Clay (Jeffrey Dean Morgan) and find themselves on assignment in Bolivia. This doesn’t go well. When “The Losers” see that their targets use children as drug mules, they tell the incoming bombers to abort. Others view the situation differently and decide to go ahead with the operation. Clay orders his team to go against orders and rescue the kids, a decision that puts them on the outs with their superiors. The Losers send the rescued kids on a helicopter only to watch it be shot down with a missile meant for them. Officially declared dead, they become stuck in Bolivia and need to work their way out of the country. This occurs when they connect with Aisha (Zoe Saldana), an operative who promises them a return to the US if they eliminate Max (Jason Patric), the baddie who tried to kill the guys. This sets the Losers on a mission to eliminate Max and clear their names. With a movie like Losers, the story becomes largely incidentall. Heck, one could claim that even the characters don’t matter a whole lot, though I’d create a less strong argument there. We have to care at least a little about the good guys, and it sure helps if we hate the villain. Which we do, although Patric’s Max is easily the best thing about the film. He gives us a character amusing in his relentlessly psychopathic behavior. Patric gives the role a bit of a fey twist, but he keeps things fairly understated – well, understated for a cartoon Bond-style baddie. Once we get past Patric, the flick’s charms became less obvious. I can’t complain about the cast, as they manage to give their one-dimensional characters some charm, even if none of them break a sweat. Still, they support the material in a satisfying manner, so I can’t pin the movie’s mediocrity on them. My biggest complaint stems from the flick’s general lifelessness. It aspires to be a wild ride with outrageous action and goofy comedy, but it never nears those goals. For a comic book movie, it comes with surprisingly little action. No, I didn’t expect non-stop mayhem, but I thought we’d get more than what I found, as the film threw out only a handful of decent set pieces. That meant it usually relied on its characters and its plot to prosper, but neither area had much going for it. The story really is just your basic Bond, and as I mentioned earlier, the characters fail to ever become anything more than simplistic. Without fun action or interesting personalities, The Losers can’t become anything better than average. It boasts occasional fun but just lacks the life and vivacity it needs. Add to that an unsatisfying sequel-bait ending and Losers disappoints. The Losers appears in an aspect ratio of approximately 2.40:1 on this Blu-Ray Disc. Losers presented a strong picture. Sharpness seemed nearly immaculate. A few shots occasionally looked a little fuzzy, but otherwise I never noticed any signs of softness. Instead, the movie looked nicely crisp and detailed at all times. Jagged edges and moiré effects created no concerns, and no edge enhancement seemed to be evident. I noticed no signs of print flaws, as the image looked clean. I recently read an article that discussed how teal and orange have become Hollywood’s “go-to” palette. Losers demonstrated that trend in spades. Though orange/teal weren’t the only hues that appeared – the jungle sequence went with understated greens, while the desert got a bleached look – they did dominate. Only rarely did the film offer tones that seemed remotely natural. However, the disc replicated them accurately, as its hues represented the flick’s design well. As for the dark elements, they were deep and dense. I thought blacks seemed nicely replicated and presented clear, taut textures. Low-light shots came across extremely well. They looked very well-defined and delineated and made the movie quite attractive. Losers gave us a fine transfer. Similar praise greeted the DTS-HD MA 5.1 soundtrack of Losers. As I expect from an action picture, the soundfield offered a lot of activity throughout the film. Guns, vehicles, explosions and other connected elements zipped all around the room in lively but natural manner. The elements formed a fine sense of setting and immersed us in the action. Music showed good stereo presence as well, and even used the surrounds at times. The soundfield seemed broad and engaging. No issues with audio quality materialized. Despite a lot of looping, speech was natural and concise, with no edginess or other concerns. Music sounded dynamic and full, while effects followed suit. Those elements were accurate and impressive, with crisp highs and rich lows. All in all, the audio proved to be very satisfying. Among the extras, we start with three featurettes listed under Behind the Scenes. This area includes “Zoe and the Losers” (5:41), “Band of Buddies: Ops Training” (16:52) and “The Losers: Action-Style Storytelling” (10:09). Across these, we hear from director Sylvain White, producers Kerry Foster, Akiva Goldsman and Joel Silver, military advisor Harry Humphries, stunt coordinator Garrett White, military equipment specialist Monty Hom, executive producer Stuart Besser, production designer Aaron Osborne, stunt coordinator Dave Schultz, and actors Zoe Saldana, Jeffrey Dean White, Chris Evans, Idris Elba, Óscar Jaenada, Holt McCallany, and Columbus Short. The shows cover characters, performances and training, stunts, weapons and action, and shooting in Puerto Rico. Obviously these programs don’t add up to a complete examination of the production, but they include some interesting material. They do manage to cover the action-oriented side of things, so we learn a fair amount about that. It’s too bad the disc doesn’t include anything broader, but the featurettes satisfy. One component comes billed under “Extras”: A First Look at Batman: Under the Red Hood. It lasts 13 minutes, 46 seconds and gives us comments from a mix of cast and crew. They basically just discuss the story and try to get us to see the movie. Which you should – it’s very good – but this remains a promotional piece of fluff. One Deleted Scene runs a mere 45 seconds. This features Chris Noth as Max in a scene during which he recruits one of the Losers to work for him. It’s unclear what happened here. Was Noth originally cast as Max and replaced by Jason Patric? Where would the scene have come in the movie? It’s too bad there’s no commentary for perspective; on its own, the sequence perplexes me. A few ads open the disc. 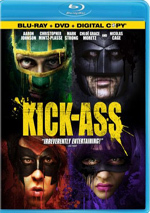 We get clips for Clash of the Titans (2010) and Batman: Under the Red Hood. No trailer for Losers shows up here. 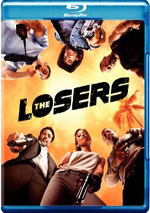 A second disc provides both a digital copy of Losers for use on computers or digital portable gadgets as well as a DVD copy of the film. This delivers a barebones package, so don’t expect any extras. While the film’s trailers promised a wild romp, The Losers instead proves to be surprisingly subdued. Oh, it throws out the occasional big action piece, but it doesn’t provide enough pizzazz to overcome its many pedestrian elements. The Blu-ray enjoys strong picture and audio but gives us fairly average supplements. This becomes a good presentation of a mediocre flick.